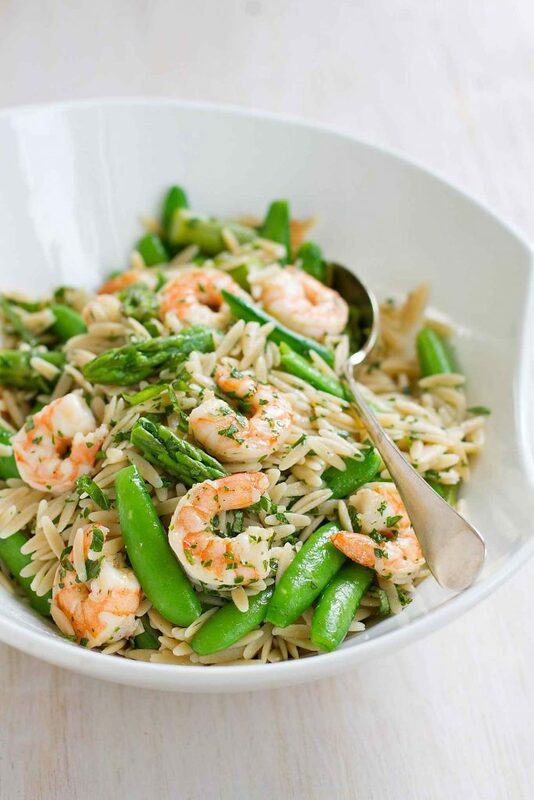 This Primavera Pasta Salad with Shrimp is fantastic for a light dinner or a picnic lunch! Packed with asparagus and snap peas. Spring has most decidedly sprung in Boston! We are visiting one of our favorite cities for the fifth year in a row to cheer on my husband as he runs the Boston Marathon today. It is always a fantastic experience, and this year Boston is gracing us with some amazing spring…almost summer-like…weather. 80 degrees yesterday! Admittedly, my Pacific Northwest blood wasn’t quite ready for that temperature jump, but we took it in stride. We’re just thankful it’s in the 60s for today’s marathon. Hot weather = miserable runners. This warm weather turns my brain towards light spring and summer recipes. Primavera means “spring” in Italian and also refers to a pasta dish filled with springtime vegetables. With the sunny days and flowers blooming, and an abundance of asparagus and peas of all kinds at the market, it was time to bust out my version of a primavera pasta salad. Pasta salad in any form has been a favorite meal of mine since I was a kid. Now that I’m the main cook in the house, I love the versatility of a great pasta salad and the ease of putting it together. I’ll often make pasta for an easy dinner in the summertime, but it’s also fantastic as part of a Mother’s Day or Father’s Day brunch, as the easy-to-pack star of a picnic or as a make-ahead potluck dish for a summertime barbecue. In this primavera pasta salad, I use one of my favorite veggie cooking tricks. Instead of cooking the snap peas and asparagus in a separate saucepan (more dishes! ), I throw them into the pasta water in the last couple of minutes of cooking the orzo. Drain everything in a colander together and immediately rinse with cold water to stop the veggies from cooking further. 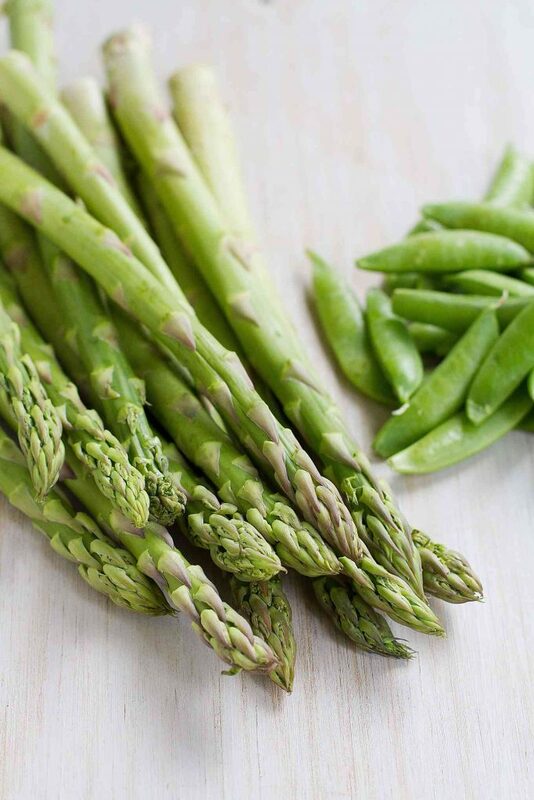 Since the asparagus stalks need slightly more cooking time than the asparagus tips, I cook them for 2 minutes, then add the tips and snap peas halfway through. Perfect, tender crisp, bright green veggies every time. Whisk the dressing while the pasta and veggies are cooking, then toss everything together with the seared shrimp and fresh herbs. The salad can be made a couple of hours in advance. If you’re doing that, you could add three-quarters of the dressing when you first make the salad, then add the remaining dressing just before serving the pasta salad to give it an extra burst of freshness. In a medium bowl, toss the shrimp with the olive oil, salt and pepper until coated. Heat a large nonstick skillet over medium-high heat. Cook the shrimp until just cooked through, about 1 minute per side. Transfer to a plate. Set aside. In a large saucepan, ook the orzo according to package directions. Two minutes before the orzo is done cooking, add the asparagus stalk pieces to the saucepan. After 1 minute, add the asparagus tips and snap peas. 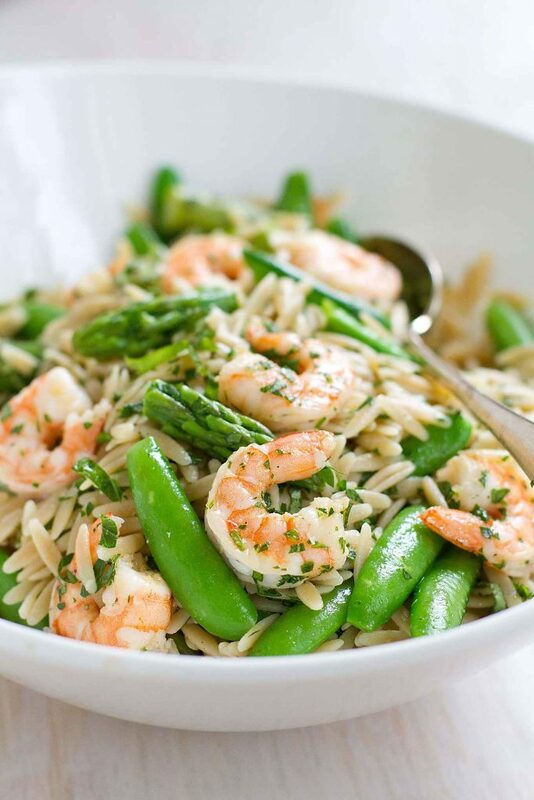 Drain the orzo, asparagus and snap peas into a colander and immediately rinse well with cold water. Transfer to a serving bowl. Stir in the cooked shrimp, parsley, mint, basil and dressing. Toss to coat. Serve. In a small bowl, whisk together the lemon juice, agave, salt and pepper. While whisking, slowly pour in the olive oil. Whisk until combined. What a great spring dish…love the colors! Thank you for the tips on how to make it one dish. I need all the help I can get on busy weeknights. This salad looks so fresh and perfect for spring. Love that it’s easy to make, too! All of those veggies scream Spring! Love the freshness. Shrimp is always a winner in my book! This is beautiful! 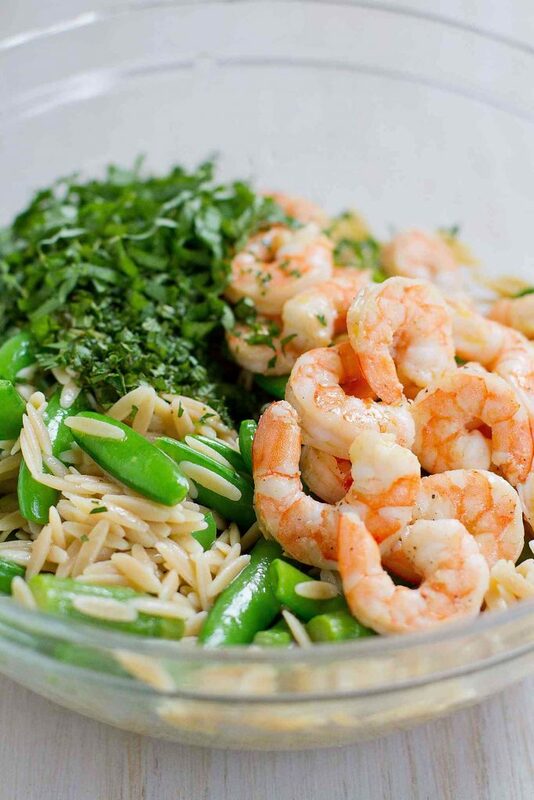 I am loving the combo of shrimp and spring veggies! Wow, what an incredible salad!! So fresh and delicious!! Such a perfect side dish or main meal! It looks so fresh and delicious! This is spring in a bowl! I happened to be visiting Boston during the marathon a few years ago. It’s so inspiring seeing the runners cross the finish line!